Just because most of them can’t hold down a job operate a motor vehicle, or maintain an intelligent conversation, doesn’t mean that pets don’t deserve the occasional treat. For some reason most of them won’t appreciate a nice glass of Port or a fine Cuban cigar, so you may have to find something a little more to your pet’s taste. Here are a few favourites. Most dogs will eat pretty much anything you put in front of them and more often than not try to eat anything in front of you as well. However, be careful what you feed your little canine friend. Many foods we humans eat can be bad for your dog, and in the case of chocolate, are actually poisonous. Here are a few treats that are perfectly safe. Pig ears are made from 100% pork and are high in natural oil, which will help to promote a glossy coat. Although they may sound a little disgusting, dogs love them and make a great treat as part of a balanced diet. They usually cost about 60p each and are available from all good pet stores. These are another slightly disgusting and quite pungent treat that your dog will absolutely love. They are easily broken into smaller pieces to satisfy all breeds of dog, and are great for promoting healthy teeth and gums. Dogs tend to love a nice bit of chocolate, despite the fact it can be very harmful to them. Dog chocolate is perfectly safe as it does not contain the chemical theobromine, which is what can cause them problems. Dog chocolate usually comes in the form of small drops and is available sugar free for overweight dogs too. 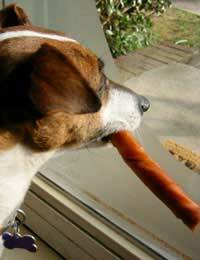 If you simply must amuse yourself by seeing what your dog would look like with a cigar in his mouth, please refrain from encouraging him to smoke a real one. Dog cigars are made from wholewheat flour, carob powder, wheat germ, molasses, canola oil, vegetable broth and seaweed and are intended to be eaten, not smoked. Although generally not as ravenous as dogs, cat like the occasional treat too. Things like milk and meat from the dinner table should only be given every so often if at all, so here are a few treats that can be given a little more regularly. Generally cats don’t tend to remember to brush their teeth, so it’s important that they get something that will ensure the health of their mouth and gums. Treats are available that have been specially designed to do just this. With the flavour of tasty meat, your cats won’t even know they’re actually reducing the build up of plaque and tartar so everyone’s a winner. Cats go absolutely wild about catnip and it is now available in convenient little drops which can easily be given as a snack or treat. Catnip pleasantly stimulates cats' pheromonic receptors and is actually mildly psychoactive so shouldn’t be given too often if you don’t like to think of your beloved little cat as a hopeless drug user. Drops come in handy little tubes and are not too expensive. This may sound a little horrible but turkey necks are a great healthy alternative to other factory produced chews and treats. They are great for the teeth and gums, and include the bones as an excellent source of protein and minerals. They are usually sold frozen and are a lot better value for money than most commercial pet treats. No, not milk from cats but milk that has been specially produced to be suitable for cats. Many older cats are actually lactose intolerant; meaning giving them milk can be quite bad for them. This milk is lactose-free and so is suitable for your pet as often as they like. It can be a little expensive but is worth the money to see the little happy look on his face as you pour it into his bowl.